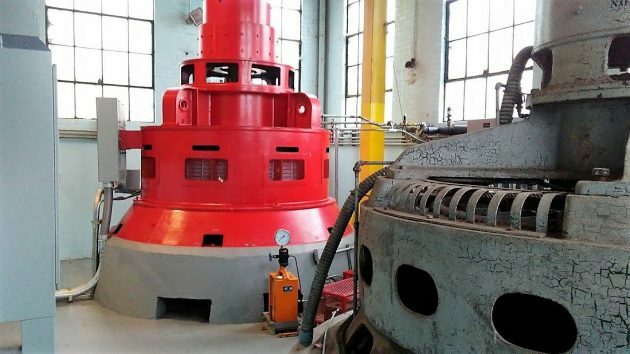 The generator in Albany’s Vine Street powerhouse has been quiet this fall, a period when normally it would have been running. But it may start up again in a matter of days and once again earning money from electricity sales. The city water department has kept the hydro operation shut down because the flow in the Albany-Santiam Canal had to be kept low in order for the city of Lebanon to do construction work in or near the canal. Lebanon is building a new system to take water directly from the South Santiam River instead of the canal. Albany Councilman Rich Kellum had mentioned the lost electric revenue at a recent work session when the council discussed a proposed agreement under which Albany is to accept for disposal a certain amount of “biosolids” from the Lebanon sewage treatment plant in order to help Lebanon this winter. Albany already takes this kind of waste material from its own treatment plant to the Coffin Butte landfill because a system designed to reduce the volume of biosolids has not worked properly since the new Albany-Millersburg Wastewater Treatment Facility was finished in 2009. Lebanon will reimburse Albany for the cost of handling the additional stuff. Thanks for the update on the hydro operation. I told my son about the transport of solid waste to Coffin Butte. He laughed and laughed. It made so sense to him. Why do we tolerate a “federal regulatory process” for a small local business like this one? Surely, it’s not interstate commerce.